FruttaWeb: Black garlic at your home with one click! From the fermentation of the classical bulb... It obtains the great black garlic. From the appetizing flavour, but without the heavy aftertaste that hits the breath. Black garlic has properties much higher than the normal classic garlic. • the level of cholesterol, because it reduces the cholesterol in the blood and prevents thrombosis and cerebral arteries. The proteins of the garlic soluble in water or essential oil prevents hyperlipidemia, reducing the blood cholesterol. • on anti- aging, in fact, as reported in an ancient Indian medical text "Charaka Samhita", garlic is regarded as a food that keeps the blood circulation, strengthens the heart and lengthens human life. In Germany, the garlic is recommended to people of advanced age and used for a long periods of time to avoid the occurrence of any type of disease. It is also recognized as a useful food to the prevention of dementia for its virtues anti-oxidants, anti-stress and for the control of blood pressure. • on anti-oxidation, as reducing the free radicals present in excess in the human body fights efficaciemente the causes that can cause diseases of the digestive system, skin disease, diabetes, cancer, etc.. The amount of anti-oxidants present in garlic, are significantly higher than those found in foods such as vegetables, fruits and cereals notoriously rich in these substances. The beneficial properties typical of garlic are enhanced in the process of drying and fermentation, increasing the benefits and its health-giving properties. 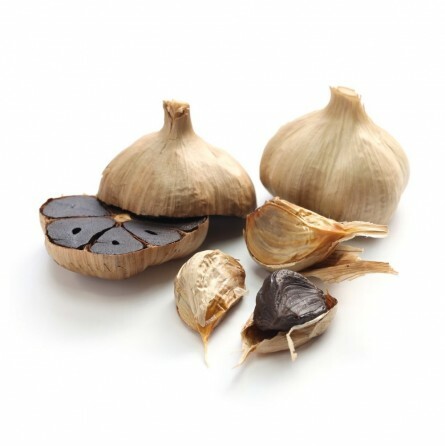 To get 1 gram of extract of black garlic it takes about 6 grams of fresh garlic, so the product is rather concentrated. For this reason, the recommended daily dose is 660 mg, which is equivalent to 4 g of fermented bulbs.mIn Thailand and Korea, two countries where it is widely used to get take the bulbs of fresh garlic and let them ferment in extremely hot temperatures for about a month. After this period, within the skin has become dry, the garlic has become black and the texture rubbery, that nevertheless retains the distinctive flavor but do not suffocate your breath! Nevertheless, the black garlic leaves have aftertaste on our breath as much as instead it is left by the classic white garlic. It can be put on bread thanks to its soft texture, add it to pasta or fish, meat and poultry, into soups or sauces, mixed to rice, salads, vegetables and on pizza. The black garlic owes its dark colour to the substance called melanoidin, responsible for example of the dark colouring of beer. The large-scale production of this product spread in 2004 thanks to the Korean Scott Kim, which founded the society, with the office in California, exclusive distributor of black garlic, considered a real health’s supplement in the USA, where it rapidly spread until it reached Europe too. Even if, to be honest, this product has been known in the East since ancient times. The garlic (Allium sativum L.) is a plant cultivated bulbous, traditionally assigned to the family of Liliaceae, but the recent APG III classification places it among the Amaryllidaceae. The black garlic is obtained by making the classical one’s bulb fermenting at a high temperature, and under conditions of specific humidity, for about 30 days, after which it is left oxidizing for45 more days. L'aglio nero è veramente buono sicuramente lo acquisterò nuovamente!